Premier League star has admitted that he would always be more than open for a move to Real Madrid. The 25-year-old who made the £70 million move from Real Madrid to Chelsea, where he has become the Blue’s main striker. 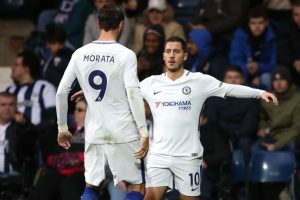 After a blistering start to the season with seven goals in his first eight games, Alvaro Morata saw his momentum halted after an injury to his hamstring. However, now with rumors about the Spaniard being out for the rest of the season have been confirmed by Antonio Conte and it looks like Morata’s luck has gone from bad to worse. The striker had come under growing criticism from both fans and pundits/critics alike in recent weeks, after missing a few big chances in key games, and that has played a part in both Alvaro Morata’s form and confidence off late. However, while Chelsea did shell out an incredible £70 million for the 25-year old’s services, in an interview with Spanish Tv, Morata went on to speak about his future. “I have to respect Chelsea who have made a great effort for me. And I’m very happy here. But Madrid is always Madrid,” said the striker to Espacio Reservado. Add Alvaro Morata’s injury/absence to the ever-growing list of concerns which also happens to include Antonio Conte getting potentially fired, Eden Hazard and Thibaut Courtois’s future, Tiemoue Bakayoko struggling to cope with the Premier League, among others and things are going from bad to worse to just downright horrible for the reigning Champions. However, now with the Spaniard’s confession, it just gives the club more things to deal with especially now that Chelsea is in a bad spot. The Blues have been struggling in the league and sit fourth after back-to-back losses against Bournemouth and Watford. Things are most certainly not going according to plan for Chelsea, and with their record signing out for the season and making such comments, there isn’t too much the Blues can do. However, while Alvaro Morata’s comments do pose a problem they need to sort out Antonio Conte, Eden Hazard, and Thibaut Courtois’ futures first, before going after anybody else. The post Premier League Star reveals that he’s always open to a move to Real Madrid appeared first on The12thMan.